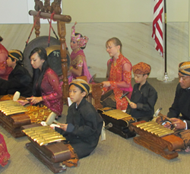 ARCINDA produces Indonesian Culture performances. One of them is Javanese Gamelan performance, a traditional music from Java, Indonesia. BROJO name comes from the great grandparent of Anie , way back in Java, Indonesia. BROJO was a powerful and had strong heroic Java, an island in the Indonesian archipelago, is a name used to describe a nice coffee and the name of a popular computer programming language. Yes, Java is a real place with a nice people and a beautiful culture. 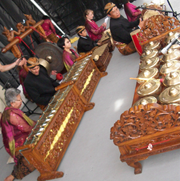 Javanese Gamelan Music is usually performed in the Palaces of Java (Indonesia). Traditional Javanese music is soft and melow, while modern Javanese music is more dynamic. Modern Javanese music/song can be transposed to western/modern music and be played together with a modern band.